Are you starting off the new year with home renovations? It is important to know the return on investment your home updates could bring. Whether you are updating to a modern kitchen or adding wood flooring throughout the house, you should consider the payouts. 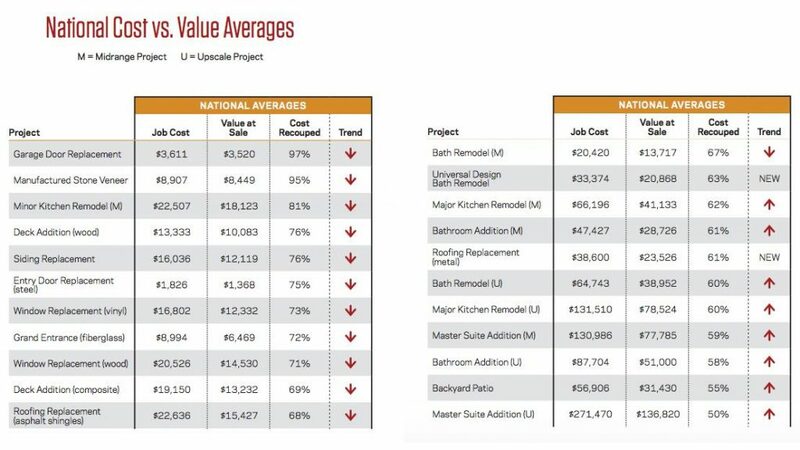 According to Remodeling Magazine’s annual Cost vs. Value Report, not all remodeling projects deliver the same bang for your buck. Which project is the best for you this year? Just like last year, the number one renovation payoff was replacing the garage door. It may not be the most appealing renovation but it earn you 97.5% of your money back. To get the statistics of this report, researchers analyzed 22 popular home improvements in 136 markets across the nation. Combined with the prices contractors charge with input from real estate agents on how much a feature would boost the market price of a home, figures were calculated to see what percentage of its cost a project will recoup. Clayton DeKorne, chief editor of the JLC Group, says the price of key projects skyrocketed while their value also dropped. This shows that Americans are spending more on renovations that will bring back the least amount of their money spent. The imports on steel, lumber, and other building materials are heightening renovation costs. This is leading to thinner margins on their return. Also, with the housing market leaning towards a peak in prices, homeowners are more weary when it comes to renovations. People are not as willing to dive into projects of all sizes. The figure below provided by Realtor.com shows the top projects and their ROI for 2019!